And with this improperly-cropped image, Kinemalogue returns. There aren't that many movies about pre-Columbian Central America. Presumably there are fewer still pitched at American audiences. The mere two that I can find any evidence of both focus upon the Mayan civilization, and therefore (as you might guess) each revolves largely upon what to our eyes seems the most salient feature of ancient Mesoamerican culture: namely, human sacrifice. Both have their merits, but let's just say that only one of them really bears recommending, and it isn't 1963's Kings of the Sun. If I spent a month watching J. Lee Thompson movies, I still doubt I'd have seen enough to make any categorical claims about a prolific directorial career that lasted forty years and truly ranged the gamut: from highly-regarded Golden Age pictures, such as The Guns of Navarone and the original Cape Fear, to lesser-known works in the 1980s, such as the reportedly excellent slasher pic, I Know Who Killed Me, and Allan Quatermain's resurrection as a store brand Indy in that enjoyably low-impact matinee, King Solomon's Mines. (Whilst in the decade in-between, he helmed the two worst Planets of the Apes—and even one of those is still basically okay.) So perhaps I can say, despite my limited knowledge, that he was pretty good, and Kings of the Sun doesn't exactly break that streak. It is acceptable epic-lite, rather typical of its day, and indeed better than some—not to mention shorter than many, which is of course a quality all its own. Unfortunately, its problems—although few of them have little to do with its actual cinematic construction—are serious. Let's go back to a thousand years ago, when the Mayan kingdom of Chichen Itza fell before the bronze swords [sic] of Hunac Ceel. The newly-crowned king of the besieged city-state, Balam, takes his people into exile across the Gulf of Mexico to new lands in the north... lands already occupied by a less-advanced tribe, yet scarcely a less-dangerous one, under the fearsome Chief Black Eagle. Can the natives coexist with the new arrivals? They'll have to, if they want to repel a new invasion by Hunac Ceel, who arrives to crush his old enemy once and for all. But when Balam takes Black Eagle prisoner, things get complicated: Balam's priests demand he sacrifice his unwitting captive to their gods—and they get more complicated still, when both Balam and Black Eagle fall in love with Ixchel, a beautiful Mayan aristocrat, who is played by a woman named "Shirley Anne." The most sweeping of Kings' confoundments—which ought to be immediately obvious from a look at two-thirds of its principal actors—is its dejectedly crummy attempt at verisimilitude. For reasons that I'm sure seemed awfully progressive at the time, Kings cast thousands of North and Mesomerican natives as extras—and then, naturally, filled the lead roles with the liliest-white Europeans they could find, whose contrast with the darker background not only throws a spotlight upon the project's invidious Before Times racism, but threatens to destroy the film's illusion of reality altogether. And that was a pretty tenuous proposition already, by virtue of Kings' batty premise, which combines brutal ahistoricity with what amounts to colonial apologia. Only Yul Brynner—that nationless, hairless human prototype—manages to blend in with his pre-Columbian milieu. But the status of his tan isn't the only reason you won't want to roll your eyes at the sight of him. It's also Brynner alone who escapes the other, even bigger problem with Kings' topline cast—their borderline incompetence. George Chakiris won an Oscar (somehow) for West Side Story, but at least that film showcased his athletic and dancing abilities. He's stuck as the young king Balam here, and when he's not fighting, which is most of the time, some of the trees in the background demonstrate a wider range of facial expression. Historical epics don't need nuanced acting, though—in fact, they do best with forceful one-note performances, which is why Brynner attained such superstardom within the genre, able to compete on the same rarefied level as Chuck Heston himself. No, the epic needs just three things: momentum, grandeur, and scope. Kings readily attains the last two, offering a couple thousand men, running around and pretending to hurt each other, and this is enough. Sadly, however, it never acquires too much of the first, as the stakes swing awkwardly from one conflict to another. Shall Black Eagle stage an exciting escape from his Mayan captors? Shall Ixchel go with him, or will she complete her betrayal of the noble warrior? No need for such high adventure here: Balam, who must remain morally upright in order to keep our affections as the film's deuteragonist, simply abolishes human sacrifice—right in the middle of this movie about human sacrifice—destroying the central dramatic conflict and with forty minutes left to fill. It's testament to the basic enjoyability of the Golden Age period piece that Kings doesn't totally deflate right then and there. 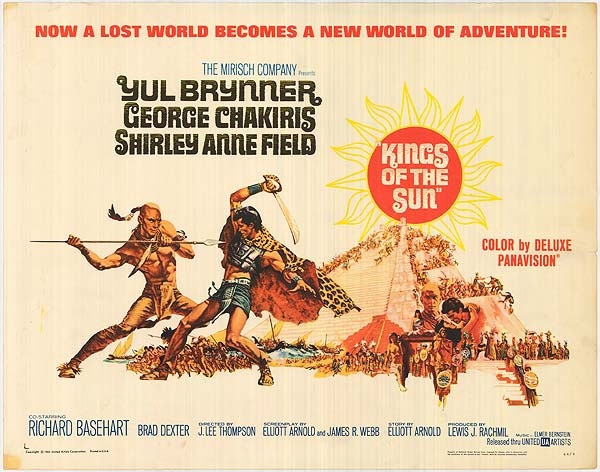 The lesson is that Yul Brynner remains watchable pretty much no matter what. And it's testament to Thompson too. If the script fails to deliver, his direction picks up a lot of the slack: it's easy to find delight in the seductive, even Sirkian shadows that define Black Eagle's prison and his courtship of Ixchel there, as well as in the well-deployed (if not particularly lavish) production design, and in a final battle sequence that is just a lot of damned fun. Ultimately, it's a small pleasure—but that beats pain any day. It has a simply excellent poster, too, and shouldn't that count for something? 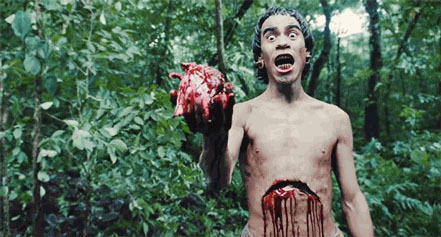 Then, 43 years later, there was Apocalypto. (It also has a great poster). It is yet another grand Gibson guignol, and is absolutely in line with the hyperviolent take on history that has defined his directorial career. Which is to say, it's fantastic. Mel Gibson, you know, is a subject of intense disfavor, but I realize now with a start that the thing I hate most about him—well, the thing I hate most about him is that he's a terrible human being. Still, what I find most aggravating about him is that his unique talent had the dire misfortune of being incarnated within the flesh of a vile, self-destroying monster. 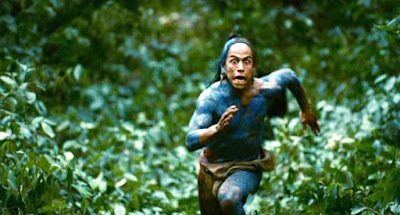 Apocalypto, the last film Gibson had a chance to make before he ended himself, competes forcefully for the status of his best; ultimately, and depending on your tastes, it must cede that ground to the more emotionally-wrecking Passion of the Christ. But certainly not without a fight. In a half-imagined neverwhen—which the film's final frames force us to date to the 16th century—a small clan of Mayans lives a happy, almost-edenic existence deep within the Guatemalan jungle, not wholly bereft of civilization, but neither corrupted by its more decadent strains. We come across a hunting party made up of Jaguar Paw, his father Flint Sky, and their friends, notably Blunted—who, as Apocalypto goes to great lengths to tell us, is having difficulty conceiving with his wife and everybody knows it. Their hunt is successful, but on their way home they're confronted with a column of terrified war refugees from a neighboring village. Flint Sky permits the travelers to pass, and our heroes attempt to return to their untroubled lives—dancing, cavorting, telling Blunted that rubbing capsaicin leaves on his junk is an effective treatment for infertility—but when the sun rises the next morning, their village is attacked in its turn. Many are killed. Those who survive are enslaved, marched through the wilderness to the urban grotesquerie of The City. There, the women are sold. The men are taken up the steps of the great pyramid. I doubt I need to describe what happens to them at the top. Hint: not a rad pizza party. In the midst of their journey, however, the slavers and their captives are confronted by a young girl. Her face is poxed; she warns of the end times. The omens she foretells come to pass—when it is Jaguar Paw's turn to be sacrificed to the sun god, an eclipse blackens the sky. The city priest (thinking quickly) declares that this means that the god has had his fill of blood. Yet when the captives are taken out to the edge of the city to be disposed of with less ceremony, Jaguar Paw's reprieve proves to be just the beginning of his trials. Matters are made more urgent when we recall that Jaguar Paw's wife and son escaped the slavers only by hiding in an inescapable sinkhole. Effective, yes; but each time the thunder roars, Jaguar Paw is reminded that if he does not escape, and soon, his family will drown in their refuge. Apocalypto thus becomes a chase through the primordial jungle—a rip-roaring action-adventure film, to balance out the miserablism of its second act. The son of the forest matches his wits and skills against the depredations of the evil men from the City. Eagerly we await to see if he shall win. Now, the first thing that Apocalypto absolutely isn't is historically accurate; yet what it also isn't, and this is an enormous surprise given the source, is a racist screed that takes a pastiche of pre-Columbian America and says "Good riddance." (Rather, it's not just that, or primarily that.) The title, though seemingly named after a DC Comics villain, finally makes some sense in its last moments. When the Spanish appear, Gibson expects us to remember that their arrival marks not just the end of an era, but the coming of a holocaust. (And if we need a reminder, the poxed prophetess serves as a nudge to the ribs.) Ultimately, the natives' struggles are made depressingly meaningless—everyone we see in Apocalypto, good and bad, will probably be dead soon enough. 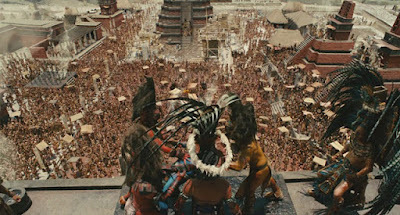 There is a annihilating sadness to Apocalypto that transcends Gibson's public circus, or at least escapes it. I can't imagine how hellish I would find life in this village, but Gibson accomplishes something rather amazing—in the half hour or so we spend there, the profoundly foreign nature of the villagers' primitive existence recedes before the warmth of their humanity. Alienating moments are few; any treatment of the jungle tribe as a zoo exhibit is nearly absent. Apocalypto's one-with-the-earth othering is confined to but one scene, where one of the villagers deploys some biotechnology straight out of Cobra-La, by suturing a deep cut with army ant mandibles. (Yes, I do know it's a thing; and it's staged here entirely for our own squirmy benefit.) Whatever else we see in Apocalypto, this jungle is totally fixed in our minds as "home." The City, meanwhile, might as well be on the moon—mirroring precisely our heroes' own impression of it. The next most important decision Gibson made—hot off his success doing the same thing in Passion—was to eschew English instra-translation, in favor of wall-to-wall Mayan dialect. It was much riskier here than in Passion; nothing like the intimate familiarity of the Gospels is here to be found. Yet it doesn't push us away: rather, it serves to further enshrine the film within (its version of) history. The fact that, in nine years, nobody has picked up where Gibson left off—despite the efficacy of this technique, despite the fact that Passion was an all-time box office winner, and despite how, all things considered, Apocalypto was a hit in its own right—is deeply, deeply frustrating. But Apocalypto differs from Passion in one very crucial way: it's a lot more conventionally fun to watch. While it may be long (though not Braveheart long), not a one of its 139 minutes—particularly once the village comes under attack—is wasted. No maker of historical epics has ever been as concerned with bodily punishment as Gibson, and he has used it to great and varied effect in his works: in Braveheart, he used it for spectacle and for emotional manipulation; in Passion, to try to comprehend Yeshua's suffering; and, now, in Apocalypto, violence comes in the service of suspense. 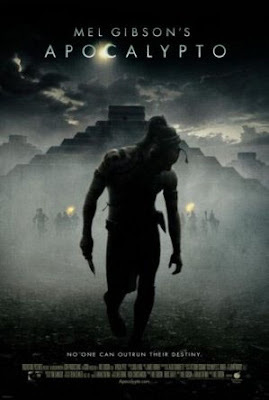 Apocalypto rarely hides its bloodshed, of course—this is the movie that, famously, lovingly lingers on a jaguar eating a man's face—but its violence often serves as a promise, building enormous tension that our heroes might be next (and, routinely, they are). It is also Gibson's most enjoyable exercise in violence—the man whose face the jaguar eats is, after all, a wonderfully hissable villain. Gibson knows how to stage violence: his brutality falls with jarring impact when it comes to characters that we like; but when it meets with characters that we don't, it comes as pure satisfaction. There's nothing better than being able to have your cake and eat it too, and Apocalypto effortlessly accomplishes both. At heart a very simple thriller, despite its monumental design and the bummer implications of its ending, it remains a breathlessly entertaining motion picture, and that matters most of all. Missing only a truly iconic score—not that James Horner is a slouch—it's in direct competition with The Last of the Mohicans for the best woodland chase ever put to pictures. Perhaps, then, every movie ought to involve the ripping of human hearts from living chests. Hell—between that, this, and Temple of Doom, well... it's practically a Goddamned seal of quality, isn't it? Updated as of 1/21/2016: I had the bodacious good fortune of visiting a used movie store here in Pittsburgh the other day, and for the first and only time since I moved here, I got one over on this terrible city: the poor dears were selling a copy of Apocalypto on blu-ray for the pittance of $12 (when the long out-of-print Region 1 disc has been retailing on Amazon through their third-party sellers for around $54). Obviously, I picked it up, and I watched it that very day. It turns out that the abuse meted out to poor Blunted, the principal reason for the original 9/10 score, doesn't seem so bad the second time around (after all, are tribesmen really known for the boundlessness of their sensitivity? ); and the visual presentation was predictably stunning--while the HD renders Semler's digital video smoothness ever so slightly more intrusive in a few early action scenes, this movie is otherwise wall-to-wall gorgeous. The upshot is that I've come to the conclusion that it is Gibson's greatest work, Passion or no Passion, and it's perfect to boot. Thus, I have uprated the film accordingly.